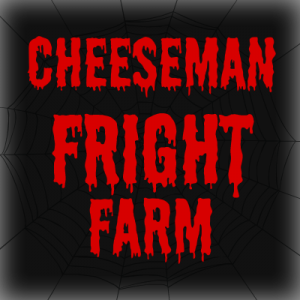 Cheeseman Fright Farm is a Haunted Attraction located in Portersville, PA. Team Scary Potter and the Hauntwarts Express reviewed this attraction on October 7, 2016. Fall time means it’s Fright Farm time to Portersville, PA. An inconspicuous family farm during the other yearly seasons, Cheeseman’s Farm undergoes a decidedly sinister shift at Halloween-time. Featuring a haunted hayride, trail and an unsettling, isolated atmosphere befitting a lifetime of sleepless nights, head out to Cheeseman’s Fright Farm this year to experience the horror for yourself. It really felt like Cheeseman’s beefed up the size of their cast this year. Throughout the corn maze segment especially, we definitely began expecting a haunted miscreant to be crouched behind every stalk. One of the most colorful Fright Farm residents from last year, the megaphone-bearing Barker was back to callously berate us. As the most vocal and interactive of the lot, we enjoyed our limited time with him most. A young woman in a precarious predicament portrayed particularly palpable perturbility and a really healthy set of lungs. Likewise, the female actor in the trailer was impressively eerie and the clowns from the 3D section were wonderfully exuberant (the gentleclown astride a tricycle chiefly among them). Unfortunately, the remainder of the cast ranged from acceptable down to vastly underwhelming. A depressingly-large percentage of the assemblage favored the “stand and stare menacingly” un-scare approach as we passed by. This is a tactic that a lot of lazy haunters choose, and can really only be effective with great costuming and an actor capable of exerting a truly frightening presence, which was definitely not the case here. It felt like a lot of the performers simply lacked the fire to put forth a convincing effort. Many tried; some didn’t bother, but there were really only a handful of valiant efforts beyond the actors singled out above. The cliche “phoning it in” sadly seemed a bit too relevant for many of them. We encountered a few interesting outfits with a uniquely-gruesome, roving monster the most memorable. However, the majority of haunters were equipped with only masks or facepaint. Street clothes abounded but, for some actors, this was sufficient. Portions of the attraction were rife with fog or obscured by deep darkness and it was difficult to see beyond leering faces anyway. The lack of full costuming was most apparent through the corn maze, which was ironic because that was the best-costumed area last season. Black hoodie and jeans; black hoodie and jeans. Again, if these had been “boo and hide” actors, concealed in fog or put forth better performances, it wouldn’t have been as noticeable; but, as they were of the stand-and-stare nature, it was glaringly obvious. We really missed many of the creative, corn-stalk-monster-type costumes from previous years there. Again, through many of the locations that we traveled, the actors’ adornments were passable or irrelevant, especially in the latter half of the trek, but there were far too many times that a mask and jeans completely disrupted the environment of the scene. The Fright Farm is, to put it mildly, a bit tucked away (to it’s great benefit : see atomsphere). Finding it, fortunately, is not difficult at all and the facade is well-lit and welcoming. Parking spotters intercept your vehicle as you arrive and guide you into your own cozy nook on the grass lawn. Thereafter, the opportunities seem endless : you may proceed to the ticket booth and toward the attraction proper, of course, but there are also a plethora of eating and shopping choices as well. On the top level of the barn, the merchandise vaults continue to swell. Standard fall favorites like pumpkins and gourds are available for purchase, as well as Frist Farm clothing and merchandise. Additionally, there are rows of Halloween-centric goodies : costume accessories, scary props, etc. When finished perusing these wares, head below deck to the main concession station and enjoy their broad assortment of desserts, drinks, chips, and more. For those requiring a more substantial meal first, though, a separate building a short walk away offers fantastic pizza options (we gorged an entire, delicious cheese pizza ourselves) to complement the offerings of the main concession area. In the humblest opinion of my stomach, Cheeseman’s definitely has the best food of any haunted attraction we’ve visited. Perennial highlights – hot cider, pizza, and, of course, PUMPKIN PIE. There were several line-haunters strolling around the night we visited and omnipresent Country music to the delight or dismay of waiting patrons. The staff were all helpful and friendly. Special Thank you to Jennifer for being so accommodating and awesome. Don’t mind me as I borrow last year’s atmosphere write-up. The Fright Farm hasn’t lost an ounce of it’s foreboding potency. The drive out to the farm is legitimately scarier than 47% of the haunted attractions I’ve been to. Small, windy, country roads in the middle of an October night have haunting power all alone. Five minutes through this foreboding hillside, you reach the attraction. There may be other homesteads around, but you would never know it. When you begin the attraction, you start on a pretty unassuming hayride, but as you are towed away, slowly, from the bright pomp of the main hub area, the creepiness begins to settle in. By the time the scaring starts, you have ridden maybe a quarter-mile and watched the friendly, welcoming barn disappear behind you. Cue fear. Maybe you’ve been on scary hayrides in the woods before. I’ll grant you that. However, remember, you’re assuredly working your way further from the barn now – quite certainly in the middle of nowhere as we finish our hayride and then… out you go. “Wait, what?” Yes, far removed from any semblance of humanity, you get deposited from your cart and the main section of the haunt begins. It is an absolutely FANTASTIC environment; it really needs to be experienced to fully appreciate. No cars driving by, no “bright lights/big city (heck, not even a small city)” – it’s just you versus an army of monsters that have been waiting all night to have their turn at you. The most notable addition to this season’s Fright Farm was a new 3D section. The effects within were pretty well done, though the tricycle room stood out the most. Cheeseman’s iconic, overly-long birth canal showed up while we were still bespectacled and I’ll admit a slight twinge of disappointment that it didn’t incorporate that particular effect at all (what a 3D birth canal would entail, admittedly, I have no idea – but it’s an interesting thought, right?) The Purple Fog Room is still the environmental stand-out and completely caught us by surprise, though the “Forest of Chainmail Ghosts”, as I have dubbed it, provides a nice visual treat, incorporating ambient lighting to a subtle, satisfying effect. Overall, set designs were largely on-par with last year, though a bit sparse in areas. There were a few moments that we exchanged “What’s that… I wish I could see that” lamentations concerning overly-dark pieces of the sets, but most of the attraction was lit appropriately when logistically necessary. There seemed to be a good bit more fog this year, which improved the creepy atmosphere of several outdoor sections. One complete “fog-out” portion was a personal favorite. The corn maze could have probably used more strobes and thicker fog at times, but it was still well-constructed and enjoyable. Cheeseman’s does not use a specific theme for their attraction. The best scares this year definitely came from unexpected sources. We were worried that our favorite moment, which occurs on the hayride, may be absent. We passed the location that we expected to be assaulted, but… nothing. A few nervous minutes later stretched on before we could breathe easily. Subjective to our passing or not, this one was especially effective this year, securing barbershop-esque fright precision. Another environmental scare on the hayride and the oft-praised Purple Haze Room also offered unsuspected startles in all the right ways. Elsewhere, uneven and shifting flooring had us creeping along uncertainly, unable to trust even the ground beneath our feet. The most effective actor scare, honestly, came from the most diminutive employee of the entire staff. A passing glance for some, but many patrons will certainly find the return of this haunter to be the most terrifying moment of the evening – perhaps of the month. It’s good to see that she was able to snake her way back into the Farm Farm this year. As for frightwork from other actors, an undead resident generated an unexpected “rise.” A few shadowy cornstalkers provided worthwhile scares and, of course, the actors singled out in the Cast review performed admirably. But, on the whole, there just weren’t a whole lot of focused, envenomed scare attempts occurring. Many of the monsters were too languid or uninterested to be more than a bother… a physical impediment to be side-stepped and forgotten. It took approximately 40 minutes to complete our journey through the attraction. The price bumped a bit this year and is now $20 per person (or $15 on Sundays). That comes out to 2 minutes of entertainment per dollar spent – that horror quotient we lovingly call SCA-LUE. Ok. This was a rough year for the Farm. They’ve implemented a few cool new ideas, lengthened the experience and assembled a few really impressive set designs. Unfortunately, the cast really just hasn’t pulled it together yet this season and the unusually-sparse costuming hasn’t helped matters. We visited in the middle of the season and believe that it is certainly possible that things can improve immensely as we head toward the Halloween crescendo; their monsters just need that metaphorical kick-in-the-pants… some genuine passion toward what they’re doing. If an actor is clearly excited about what he’s doing, we (the customers) feel it, internalize and become excited with him; if the opposite is true, well… so it goes in the opposite direction. Cheeseman’s has a great behind-the-scenes staff and, if anyone can light that much-needed fire, they can. For now, I will say that we did enjoy our visit and Cheeseman’s Fright Farm is still a good way to spend a haunted evening, preferably with a slice of pumpkin pie in each hand. I havent been here in a few years but tonight I returned and the hayride is a complete dud with two …show more scenes one way to long chainsaw stop and the other you exit the wagon, but the walkthrough is def well worth it and the clowns are also a dud. The employees seem to not understand manners at this place and the clowns without masks on had attitudes. The ones with masks on were creepy they just need to interact more then just stand there. I would def recommend this place for the walkthrough alone because they had tons of masks and many actors!! not cause of the hayride or the clowns or the employees that are rude. We had a decent time! I thought it was better then last year. We went early last year and seemed like everything wasn’t up …show more and running well yet. So this year there was more haunters and it was just terrific. We had fun and look forward to next year. That was a good one where you begin in the maze 1 the skeleton was set up in a perfect position and got us good along with the zombie inside the canister/storage which was new this year and the rest of it was great.